The story of the Beasts of Satan began in Golasecca, a small town near Varese, when the police discovered inside a greenhouse next to a cottage , the disfigured body, partially buried, of Mariangela Pezzotta, 27, daughter of a leading member of Forza Italy. Immediately investigators realized they had to deal with an unusual murder. Beasts of Satan were accused of 4 homicides and they were linked with the disappearance and suicides of at least other 18 boys and girls. It all began, or rather finally ended on 24 January 2004 when the guardian of a local company called the police claiming a young man was screaming and kicking cars outside his office. When the police arrived minutes later, they found a guy called Andrea Volpe: they immediately realized they weren’t dealing with the usual bum. The boy was dirty, he had a shoe with no laces, no jacket although was a frosty morning and it was clear he spent the night abusing drugs and alcohol. Agents started questioning him about the reason of much anger. Andrea claimed he was with his girlfriend near the bridge over Villoresi stream, when a group of ten or even 20 guys attacked them from the woods. In the meanwhile, Andrea’s parents arrived and they asked him what happened. Andrea already told a whole different version of the story. Police begun to worry since maybe a girl was in danger. Volpe accompanied the police on the exact location. Once arrived at the scene, they found a Fiat Uno stuck in a wall of the bridge. Little further on, there was a Honda Accord with Elisabetta Ballarin hunched over the steering wheel. They feared the worst: the girl was under the effects of drugs and hardly could answer to the questions of the agents. From a quick check, police went up to the owner of the Fiat Uno. The car belonged to Annamaria Pe, the mother of Mariangela Pezzotta. The couple was brought to the hospital for first aid. Here, Elisabetta told Andrea’s mother they killed Mariangela Pezzotta and they left her corpse in the woods. Police immediately went to the cottage of the Ballarin family in Golasecca. In the greenhouse they found the body of Mariangela, partially covered by dirt. Mariangela first was shot in the face from close range and then, since she wasn’t dead already, she was finished with a shovel. Police found in a bedroom a huge burning candle and a strange statue, called “The Militant”. Initially, these clues were not associated with esoteric cults. Investigations were focused on the reconstruction of the events of the night before. On the evening of 23, an evening of new moon, Mariangela was called by Andrea, her ex-boyfriend. He told her to join him at Elisabetta home, in Golasecca, to record a videotape. Mariangela, minutes later, arrived at Elisabetta cottage. Immediately she understood Andrea and Elizabetta had already abused of alcohol and drugs and they had other ideas in mind. Elisabetta took a rifle, while Andra pulled out a Smith & Wesson, blocking Mariangela way out. Shortly after, Andrea shot in the face Mariangela, from few centimetres. However Mariangela was not yet dead, and this detail freaked out the two and they eventually began to lose lucidity. Andrea decided to call Nicola Sapone, a friend of the couple, who blamed both for their ineptitude (“you can’t even kill a girl”). When he arrived, they dragged the body of the dying Mariangela in the greenhouse, where they finished the girl hitting her with a shovel and burying her. At this point, police finally understood that this story was much bigger than expected. After reading the local newspaper Michele Tollis finally understood everything. Michele was the father of Fabio Tollis, 16, who was mysteriously disappeared six years before along with his girlfriend Chiara Marino, 19. Michelle spontaneously went to the local police since he already knew Andrea Volpe and Nicola Sapone. He brought a big archive of news and hints about the disappearance of his son, collected over the last six years. Besides Volpe and Sapone, the report mentioned other people: Paolo Leoni, Eors Monterosso, Mario Maccione, Marco Zampolo and Pietro Guerrieri. Tollis denounced several times this circle of men: he was never took too seriously. What he found was very disturbing. The group of friends usually strolled around “Midnight” club in Milan, mostly frequented by heavy and death metal fan. Police tracked down all the people mentioned in the report of Michele Tollis and finally picked up the file on the death of Fabio Tollis. They were interrogated by the police. Agents discovered an horrific scenario: Beasts of Satan, mentioned by Michele Tollis, really was a satanic cult actively operating in the area and responsible of the dead of at least 4 people. At this point there are at least two main hypothesis on the structure of the sect. The first idea is the sect was just composed by a bunch of boys who claimed to follow the way of Satan. They were ruthless, violent and desperate. The second theory wants a second circle of inspirers of their crime based in Turin. However few clues are presented to defend this theory. After the phone call, Fabio entered in the car with Volpe and Sapone, followed by another car with Chiara Marino and Mario Maccione. Chiara and Fabio were conducted in Somma Lombardo woods, in front of their empty grave, already dug. Here, Fabio was found guilty of being too ambitious to climb the hierarchy of the sect and Chiara was accused to be the Virgin Mary. They were condemned, stabbed to death. The grave was dug day before by Pietro Guerrieri and Andrea Bontade. However that night, Andrea Bontade didn’t come. Andrea committed suicide later. The two poor victims weren’t dead already: Nicola put in their mouth some chestnut leaves, then he dipped a cigarette in their blood and he start to smock. Then he danced over their grave screaming “Now you’re both zombies! Try to get out of this hole, if you dare!”. The next victim was Andrea Bontade, guilty of cowardice for not having presented the evening of the murder of Fabio and Chiara. The other affiliates tried to stun him with cocktail made of drugs for the purpose of inducing suicide. On 21 September 1998, Bontade after spent the night with his “friend” drinking and abusing drugs, he took his car and crashed into a wall at a speed of 180 km/h. 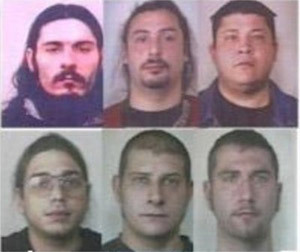 “On February 22, 2005 Andrea Volpe and Pietro Guerrieri were sentenced in the northern city of Busto Arsizio to 30 and 16 years respectively. Volpe, in addition to the 1998 murders, was also found guilty of the 2004 slaying of Pezzotta. In Volpe’s case the sentence was a decade longer than requested by prosecutors.